Laser Hair Removal - W1 Tanning and Beauty London UK. Smooth skin that makes your fingers glide over giving the ability to wear certain clothing is every woman’s dream. Laser hair removal is a noninvasive and convenient method for permanently reducing/removing unwanted facial or body hair making life simpler. It is also known as light based hair removal or laser hair reduction, it leaves the skin looking smoother and silkier than waxing, electrolysis, depilation or razors. It is a gentle technique that causes permanent hair reduction effectively, with minimal discomfort and no downtime. How is a laser hair removal procedure performed? 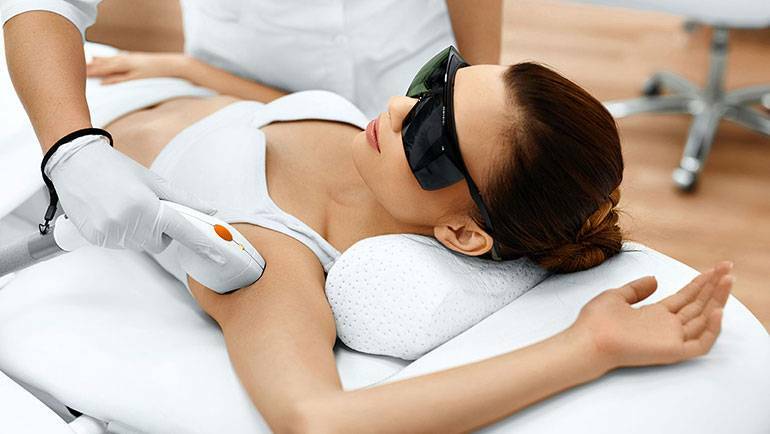 Most salons use a low-energy laser beam that is personalized as per the client’s skin color and to the color, thickness, and location of the hair that is to be removed. Before the actual treatment begins a test is conducted A low-energy laser beam passes through the skin which will be absorbed by the pigment of a percentage of the active-growth hair follicles. This area will be observed to make sure that the settings are correct and to check for any adverse reactions to treatment. If the test proves successful, the low-energy laser beam is then systematically directed spot-by-spot to the areas to be treated, instantly and permanently disabling the active-growth hair follicles with each treatment. Hair follicles that are in a dormant phase have no effect of the laser. Pregnancy, burns (on areas to be treated), cancer, vitiligo (on areas to be treated), hormonal imbalances affecting hair growth (polycystic ovaries/thyroid), epilepsy, shingles, keloid scars, melanoma/moles. Post treatment clients are advised to avoid any heat treatments e.g sauna, steam and gym as this will cause extra sensitivity to the treated area. No waxing, tweezing, epilation or any stimulation to the root. Aloe vera can be applied to soothe the skin. No exposure to sunlight and you are advised to wear SPF 50 at all times.